Christopher Llewyn Ramirez (left), Sally Nystuen Vahle, Jon Shaver and Liz Mikel share laughs over mutual pain at their favorite bar in Lynn Nottage’s “Sweat” through Feb. 10, presented by Dallas Theater Center at Kalita Humphreys Theater. Playwright Lynn Nottage has earned a stellar reputation in Dallas theater. “Ruined,” Nottage’s 2009 Pulitzer Prize-winner for drama, thrilled Dallas audiences in 2017 when presented by Echo Theatre at the White Rock Bath House Cultural Center. Now Nottage brings her Pulitzer Prize-winning play, “Sweat” to the Dallas Theater Center (DTC) through February 10. “Sweat” is set in Reading, Pa. in the early 2000s. The town was a microcosm of the country, characterized by life in Pennsylvania’s Rust Belt, where labor worked long, hot hours for unfeasible wages just to make ends meet, and where lay-offs were, at any time, a heartbeat away. Factories were basically the only source of work in the communities, rendering towns dependent on them for jobs, while families relied on the income. Best friends Tracey and Cynthia rely on their steady factory jobs, their favorite bar and each other. When a recession hits, their lives are turned upside-down. Their story, along with those of the bar’s other regulars unfolds filled with fear, love, hate, bigotry, angst and desperation. 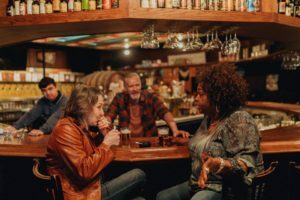 Set designer William Bloodgood created a stunning, heavily wood-paneled pub-style bar that is warm and inviting and is an ideal backdrop to the story. Characters take full advantage of the set, from warm conversation between friends, to drunken revelry, to gang-like rebellion leading to vicious confrontations. “The current policies attack people different from the dominant culture, separating people based on issues of race, class ethnicity and nationality. Gender, too. 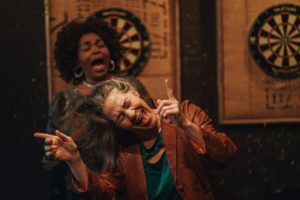 Gender comes up many times in this play in the characters of Cynthia, an African American woman, and Tracy, a white woman of German descent, both strong, forceful women. They are best friends when the play begins, but the forces of division begin to chip away at that friendship, and their families fall apart, in turn. Their story is told with compassion for these people whose lives don’t often see the footlights of the American stage. We see these underrepresented workers in a sympathetic light that gives us empathy for them as people,” Bond told Theatre Jones. Actor Sally Nystuen Vahle brilliantly makes the role of Tracey, the close friend of Liz Mikel’s Cynthia, her own. Mikel’s Cynthia remains optimistic and empathetic while supporting her friends during factory layoffs. Along with Mikel and Vahle, “Sweat” features some of Dallas’s finest actors, including Kyle Igneczi, Tyrees Allen, Kenajuan Bentley, Christopher Llewyn Ramirez, Jon Shaver and Barbra Wingerd. Ace Anderson plays the role of Chris with meticulous skill and passion. Dallas Theater Center’s “Sweat” runs through Feb. 10 at the Kalita Humphreys Theater, 3636 Turtle Creek Blvd., DTC’s former home. For tickets, call 214-880-0202 or visit dallastheatercenter.org.